The words made famous by former White House Chief of Staff and current Mayor of Chicago Rahm Emanuel are, “never let a good crisis go to waste.” Of course he should have added in the very descriptive adjectives of “politically manufactured” right before the word crisis. And so it goes, not even one week since the shootings by a racist sociopath at Mother Emanuel AME Church in Charleston, South Carolina, we see the politically manufactured message being disseminated and promulgated by the liberal left progressives who seemingly own the Democrat party. 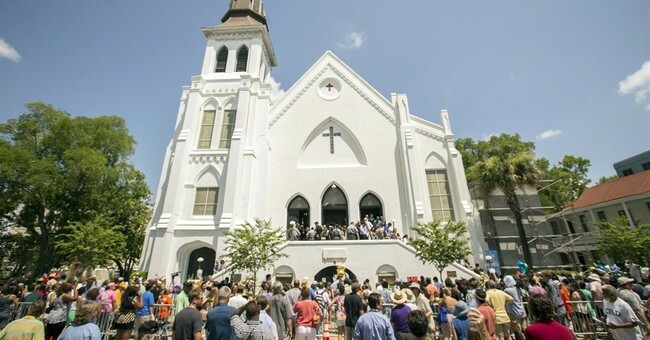 Instead of heeding the teachable moment being displayed by the people of Charleston, Emanuel Church, and even the family members of the souls who were horribly taken away – the message remains on that which seeks to divide. As we watched the services, the response, and human bridge of unity on this past Sunday, the prevailing ranting was still about race. Let me make myself very clear: the sick, demonic individual who perpetrated the heinous attack a week ago should burn in hell. The act of evil he committed in unconscionable. But it was an individual act, recognized by the people of Charleston. To try and elevate this into some national level discussion is nothing more than political opportunism. Need I remind those of us who know American history, it is rather hypocritical of the Democratic Party to believe that they are some champions against racism. Historically, they are the party of slavery, secession, segregation, Jim Crow, lynchings, poll taxes, and literacy tests. It was President Lyndon B. Johnson, who on Air Force One before other governors, used a racist epithet to describe how his policies would have blacks voting Democrat for 200 years. We are fifty years into the seemingly intended consequences of those policies. Policies that have advanced a new type of slavery; not the physical but rather the metaphysical – economic enslavement of our urban centers, mostly populated by the black community. It appears to me that the feigned outrage being displayed truly has more to do with political posturing rather than heartfelt care or concern. The politically manufactured crisis being touted – to include the liberal media “gotcha” question about a confederate battle flag – has little relevance to the real issue. Why is it that we do not hear about the same outrage with black on black murder happening in the hometown of President Obama and candidate for president former Secretary of State Hillary Clinton, or in the hometown of presidential candidate Martin O’Malley. Yes, I am referring to Chicago and Baltimore. Do the hundreds of lives of young black men lost in these cities not constitute a crisis? Remember, it was an older black man who brought the legal challenge to the restrictive gun control laws in Chicago because he wanted to be able to protect himself. What we are witnessing is a politicized manipulation and obfuscation of the many crises that plague the black community – many of which were caused by the liberal progressive socialists of today’s Democratic Party. Consider the crisis of good quality education in the inner cities. It was the first black President who decided in April 2009 to cancel the DC school voucher program – his kids attend the prestigious Sidwell Friends. It was the first black Attorney General who brought a lawsuit against the state of Louisiana and their school voucher program. Should we not consider it racist when young minority children are denied access to better quality schools and educational opportunities? Once upon a time the Democratic Party stood outside the doors of institutions of higher education denying access to blacks. Today’s Democratic Party embraces policies that trap young blacks inside the doors of failing public schools denying them access to better quality institutions of learning. What about the crisis of the decimated black family? Fifty years ago at the time of Johnson’s signing into law the policies of his “Great Society,” the two parent black household was at nearly 77%; today it is at 25%. That is a crisis – but why does the Democratic Party not talk about that horrific phenomena? Sadly, nine wonderful souls lost their lives while in church attending Bible Study. However, since the 1973 Roe v. Wade decision between 13-16 million black babies have been aborted. These are lives that will never know the dream of which Dr. Martin Luther King Jr. spoke of, nor the American dream. As a comparison, between 2-3 million blacks were killed during the era of slavery. All black lives do matter. Sadly, not just those related to the politically manufactured crisis dictated by those who seek an opportunity to not be wasted. There are many crises in the black community, and indeed the world. The victimization of black Christians in Nigeria by Boko Haram comes to mind. Or the crisis of black Kenyans being slaughtered by Al Shabab. Why are these not priority crises which need the attention of the political opportunists in the Democrat party. If no one has paid attention, the Governor of South Carolina is a minority female, twice elected. One of the two Senators from South Carolina is a minority male. Is there racism in America, sure-- as well as other forms of hatred. However, leaders find the means to unite towards a common goal. Politicians seek to divide for their own selfish gain. There are real crises. Then there are the deceptive manipulations that take our attention away from the real crises.